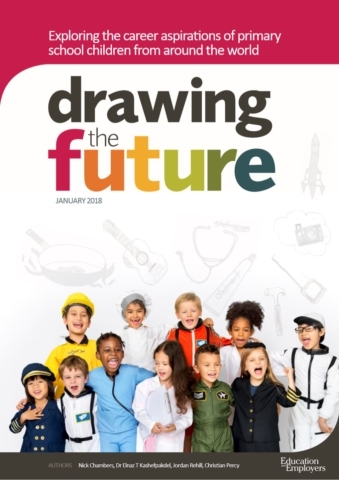 The survey was undertaken in partnership with Tes, the National Association of Head Teachers, UCL Institute of Education and OECD Education and Skills, asks primary school children aged seven to 11 to draw a picture of the job they want to do when they grow up. To determine the factors influencing career choices, the survey also asked participants whether they personally knew anyone who did the job, and if not, how they knew about the job, as well as their favourite subject. The findings will be presented at a private meeting of Education Ministers at The World Education Forum on the 23rd January. The report will be formally launched at a breakfast with senior business leaders at #Davos #WEF18 on the 25th January. Over 20,000 entries have been received (from UK and internationally) and international participants include Australia, Belarus, Bangladesh, China, Columbia, Indonesia, Pakistan, Romania, Russia, Switzerland, Uganda and Zambia. More information and the full report is here.